TERESA COLLINS : HAPPY BIRTHDAY SETH!!!!!! I am LOVING the beautiful weather here in Utah. It's about 70 degrees and the perfect Spring warm. It makes me want to be outside all day long. 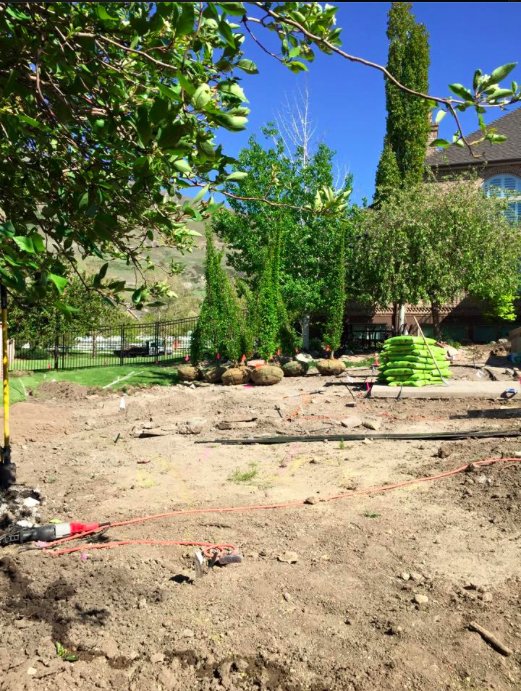 We are having our backyard done right now and I have really loved planning the plants, trees and the design. We had a mess with our sprinkler system with our new home. It had 28 zones that were a complete "nightmare". So we decided to redo the sprinklers along with our many changes to our backyard. This photo below means so much to me. This was taken while Seth was home from Mexico and before Seth went back out on his mission. It was rare because Ty hated his photo taken and I asked him if I could take one of him and Seth. He allowed it and I was so grateful. I know this photo will mean so much to Seth too. It is him and his dad. He knew when he went on his mission that his dad was so sick and he would probably never see him again in this life. 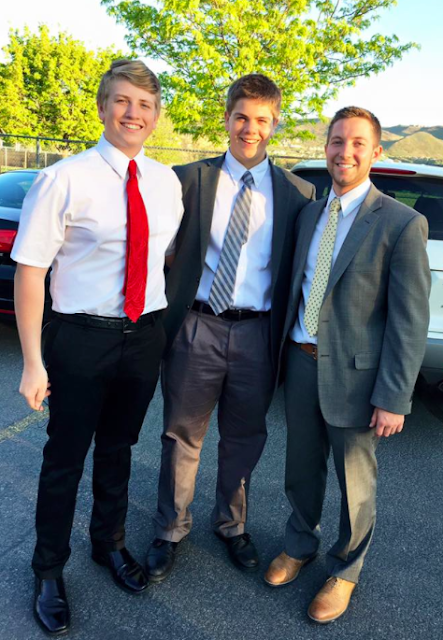 What a brave boy he was and is!I know that this was a special time in our life and having Seth home with us for that year before he went back out his mission. I will forever cherish this time. I wanted Ty and Seth bond and become so close. Seth spent countless hours helping his dad move his entire office, he spent countless hours talking to me and we grew so close. Seth would do my "honey do's" at our house and kept me company when Ty was so sick and in bed. We watched Duck Dynasty together and Ty thought we were NUTS for being obsessed with the show.. He loved his dad and Tyler loved him. 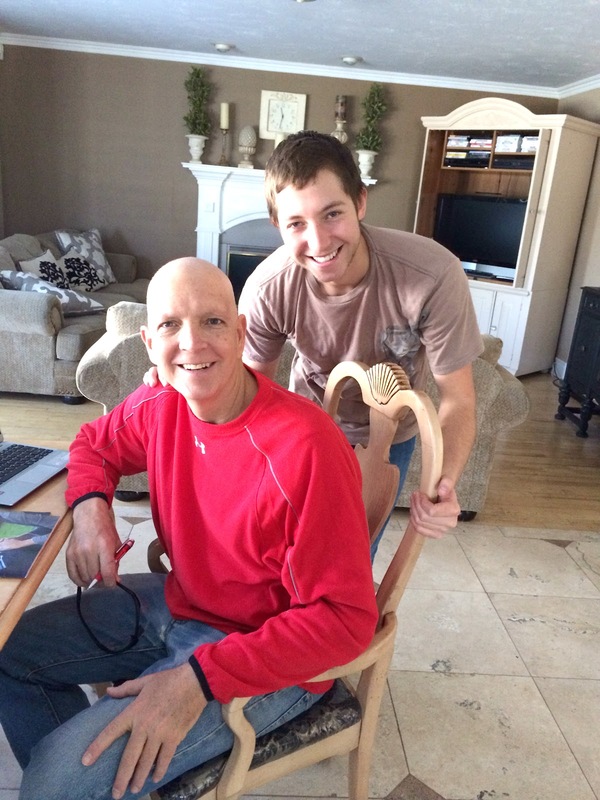 Seth is such a great young man and his mission has made him so strong in his desire to be MORE. It was Seth's 22nd birthday yesterday. He is working full time and is so busy and so every time we see him we love it. I tell the family to use Seth as the role model on how to work. He also shares how he was "lost" for a time in high school. It was rough at time and he eventually figured out what he needed to do to be happy. He did this on his own, in his own time and with great hope. I love you Seth. I am proud to be your "other" mother. Seth came over and we went to the church. Zach was ordained the Melchezidek priesthood in our church. It was so beautiful and Seth gave him the ordination/prayer. I was crying so hard. The spirit was so strong and I knew that Tyler was there. 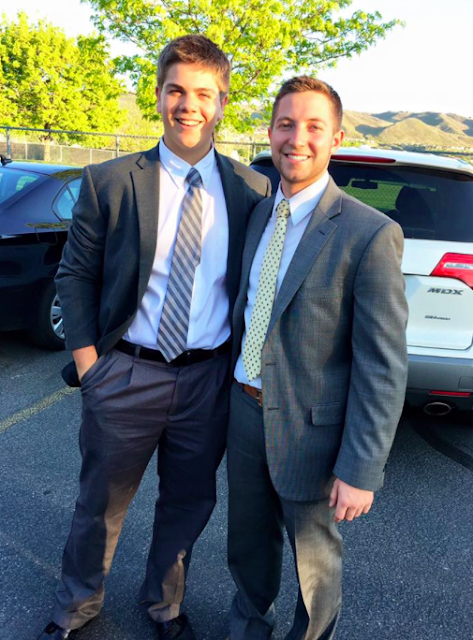 Seth told him that their dad was his angel and would be there on his mission with him. He told him how proud and happy his dad is. McKay was able to come last minute. The girls could not make it. They had to do it last night because Zach needs his visa asap so he can go to Brazil. I thought it was sweet that Zach wanted just his sibling and Brian and I there. Zach took this GIFT very seriously and I think he gave me the biggest hug I have ever got from him. The bishop asked me to say something. I told Zach, Seth, Ty and McKay that I know Heavenly Father is real. That they have been through such hard times losing dad and that they still are having faith and strength to accept these hard challenges. I am proud of them. They each want to make their dad proud. I told them that I know that they know in life NO MATTER what they face that they can endure it and go through it. I told them how much I love them and being their mother. Family is there for each other. I have seen this so strongly as my kids are best friends. They would rather be together or hanging out all together at our house than anything else. This was one of my biggest goals in being a mother. I wanted the kids to have a built in set of life long best friends who will be there for each other. Yes, with our BIG crazy family it can get loud and chaotic at times but I would not have it any other way.